Hello!! Bringing you my first Barielle post today! I really looked forward to trying this brand! This Spring collection "reflects the soft, gentle, eclectic hues of this most welcome and delightful season." They aren't kidding about eclectic. lol. In my opinion these are not your typical Spring shades. Let's take a look! 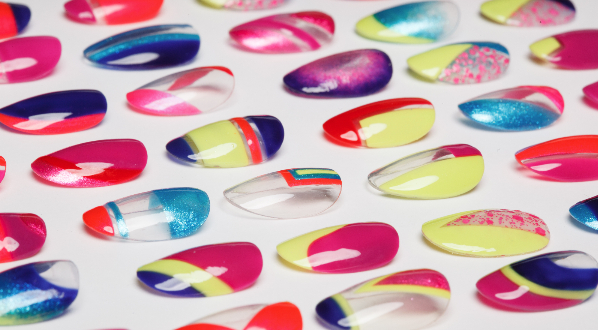 Barielle Gentle Breeze collection dotted nail art. I took my inspiration from the press release photo! 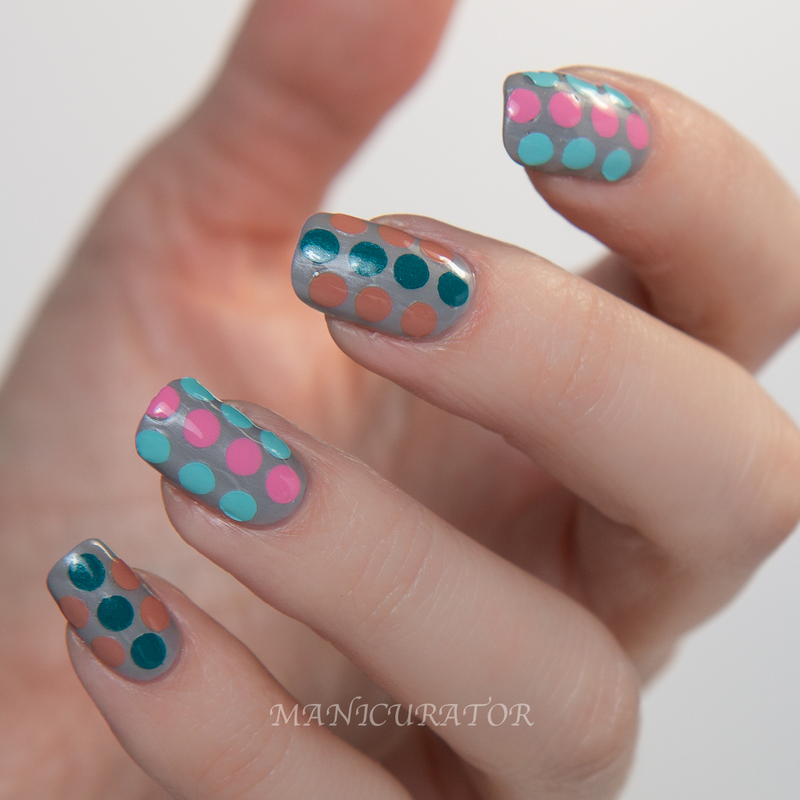 How cute are these perfect dots? I started with 1 coat of Gray Sky, which has good coverage with somewhat of a frost finish. I painted swatches of the other colors onto wax paper the day before (3-4cts), allowing plenty of time between coats. Then when I was ready to use them, I peeled each shade off the wax paper and used a hole puncher to punch out perfectly rounded dots. I applied a second coat of Gray Sky and while it was still wet, placed my dots! You can see in the 2 photos above that I took some pics before top coat went on, and in fact really liked it that way. The first photo of the post and the above and below are with top coat. Are you a dotticure fan? I think these turned out really cute! Definitely not typical spring colors! I think the only must have for me is Heaven Sent. Yup, in a way though I'm glad they aren't the usual pastels! At first I was going to be angry at you for making such perfect dots, but now I see why! Haha! 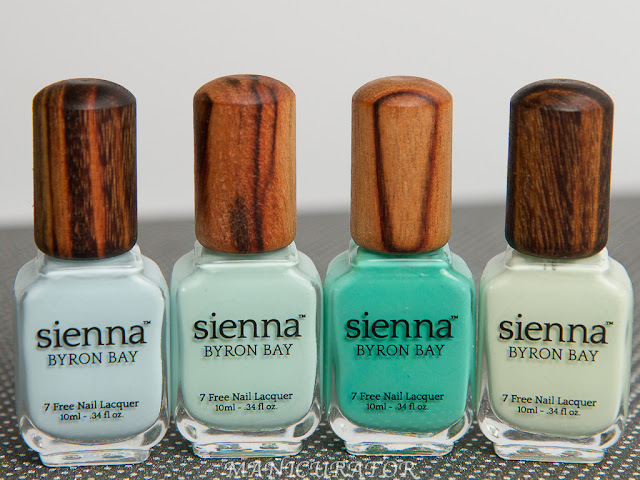 (PS: I totally didn't realize it was an "eclectic" group of polishes until you pointed it out, and you're so right. They are pretty out there!) Anyway, gorgeous mani! This reminds me of candy buttons in a way! Very cool! Your dotticure is perfect! I need to try the wax paper-hole puncher method. I love Gray Sky and Champagne Bubbles from this collection. Heaven Sent is my favorite of the collection. You're right they def aren't your typical spring shades. I was wondering how you got those perfect dots! Who would have thought of doing them on wax paper? That is brilliant! The first thing I noticed was the perfection of the dots. Clever way to achieve them! 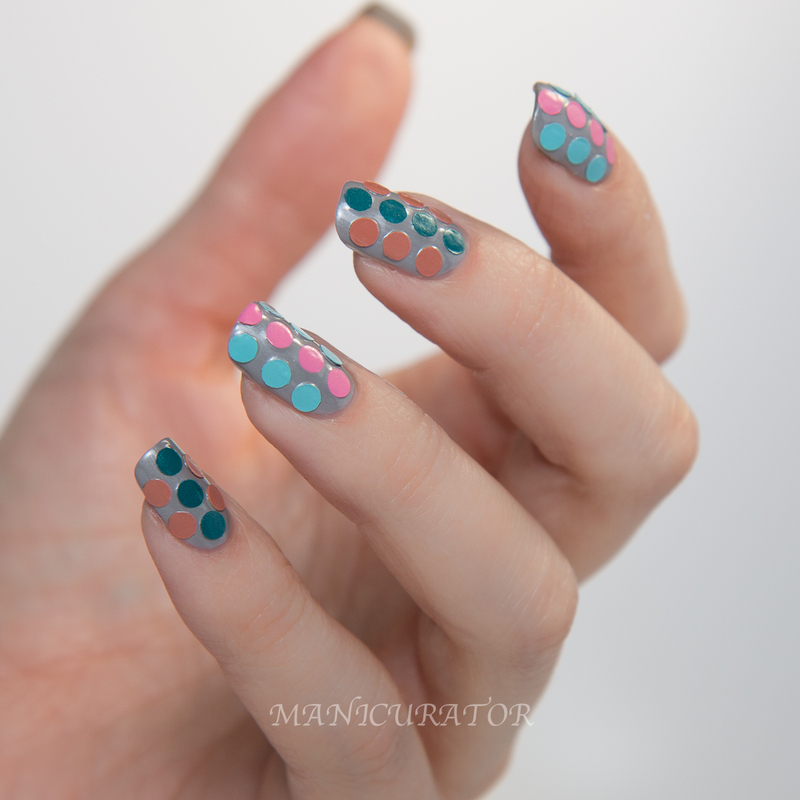 Did the color on the dots smear at all when you applied topcoat? What a perfect set of dots you created, love it! Oh, I have some of Barielle silver colors and they are awesome, I'll have to check out their other shades now, thanks! What a creative idea for the dots!! They look perfect! I was already wondering how you made those dots so perfect - it all makes sense now! Great way to use these shades together :). It's a nice blue for sure! Such an awesome idea for those of us who can't get dots to look the same...ever. Hi Victoria, I hope you will be doing regular Barielle reviews in the future. I think they are an under-rated and under-appreciated brand. But since they aren't sold in stores (that I'm aware of, anyway), we consumers have to rely on bloggers for information about them. I think the company is stepping up marketing and promotions -- I've been getting emails about great deals ever since Christmas (having bought from them online in the past).